Strip Gives: Bare Necessity --- CLOSED!!! 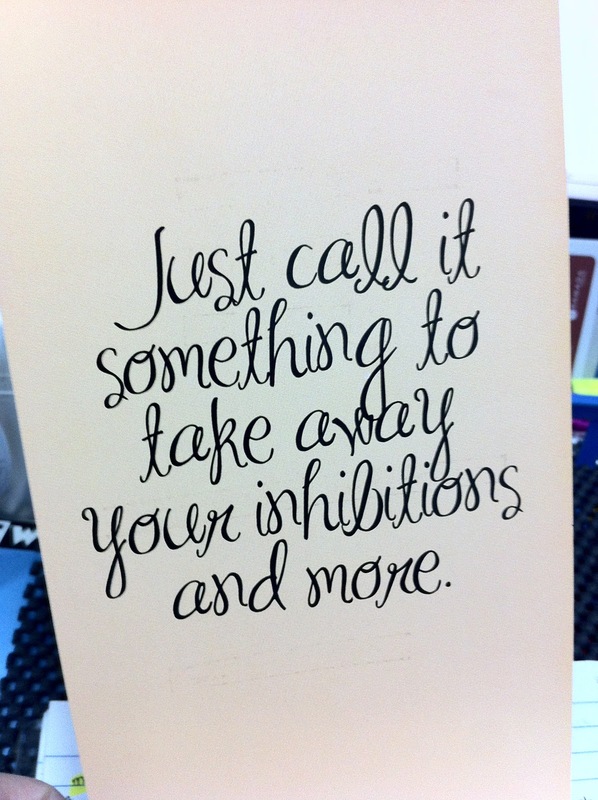 Okay, since today, I just turned 18 *winks* I am mature enough to talk about the Bare Necessity! In this generation, waxing "down there" isn't something we need to whisper about as it is also for hygiene. The reason why I'm mentioning what's "Down There' is because I will be continuing the good vibes care of STRIP. 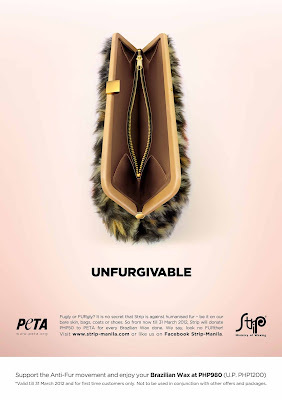 STRIP Philippines teamed up with PETA (People for the Ethical Treatment of Animals) and a bold campaign was born --- unFURgiveable message. The event was launched via an exclusive photo exhibit done by acclaimed Fashion photographer Miguel Miranda. He presented photos of various personalities Jasmine Curtis-Smith, Isabel Roces, Phoemela Barranda, Nina Estaco, Kylie Padilla, Ornusa Cadness, Roshni Hemlani, CJ Jaravata, Xtina, Kit Barraquias, Laureen Uy, Xeng Zulueta and cheeky Radio Djs Sam YG, Slick Rick and Toni Tony of Boys Night Out were captured in next to nothing but lavish jewelry, bags and accessories created by Martin Bautista, Gabriel Martel, Nicole Whisenhunt, Joyce Makitalo, Trousseau by Reshma, and Princess Peacock. The shoot was styled by young but talented stylist Gerick Ortiz. Comment ONCE together with your name and email address. Answer this question: "Why do you want to try Strip's Brazilian All Off Waxing?" Contest starts Today ends March 15, 2012. ONE winner will be picked via Fruit Machine. Please make sure to join the contest if you can visit STRIP Ministry of Waxing Serendra or Greenbelt Branch. Please follow voucher terms and conditions. ONE winner will be picked via Fruit Machine. Winner will be announced and an email notification will be sent! Voucher will be sent via courier. "From January 13 until March 31,2012, STRIP will donate Php50.00 to PETA for every Brazilian wax treatment done. First-time customers enjoy a special discount on Brazilian waxing treatments for supporting the anti-fur movement too!" I want to try Strip's Brazilian All Off Waxing (once more), because ever since my first visit, I don't think I can ever step into another waxing salon for a Brazilian. They're that great! I want to win because I am a huge fan of Strip Manila especially their Brazilian wax. i've been really wanting to try brazilian waxing for the longest time now but haven't bcoz i wanna try it at strip manila but can't find any branch near me.. and i have no idea how much it cost so i can't set a budget for it..hihi! I want to try Strip's Brazilian All Off Waxing because I have never tried Brazilian waxing! I want to try Strip's Brazilian All Off Waxing because I heard they are the best in providing this service! summer is approaching, and i think this is the best time to try the Strip's Brazillian All Off Waxing to get my self ready to done a two-piece in the beach! Never tried Strip before and i read a lot of good reviews about it! i want to try Strip's Brazilian all off Waxing because I never tried waxing all my life and i want to be the first to rip it off! i want to try Strip's Brazilian All off Waxing because i never tried waxing all my life. and i feel the product is worth it. I want Strip to do my first-ever Brazilian wax, as I trust only the experts. So I really hope I get to win Strip's Brazilian All-off waxing! I want to try Strip's Brazilian All Off Waxing because I'd like to wear a bikini and not worry about any hair showing.